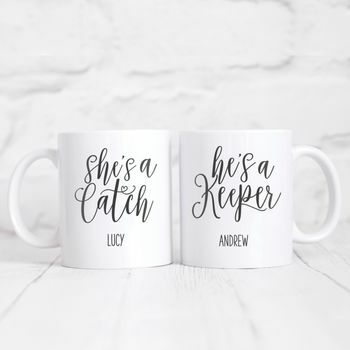 A pair of beautiful personalised ceramic 'He's a Keeper' and 'She's a Catch' mugs. These gorgeous personalised 'He's a keeper' and 'She's a catch' mugs make the perfect gift for couples of all ages. A great gift for anniversaries, weddings, Valentines Day or even a cute way to announce an engagement!